In this update of Kalium you will be introduced to some great new features of Kalium which mostly affect the code structure of Kalium towards new future of template hierarchy and WP hooks. Kalium is now faster, more secure and even simpler to extend or customize via child theme! In the past, all Kalium templates were located in kalium/inc/ folder. Most templates are still there, however, they are all deprecated now. We have created a new implementation of theme templates which is very practical and easy to customize. The new templates will be contained in kalium/templates/ folder and separated by section, for example, all blog templates will be contained in kalium/templates/blog/ (same as WooCommerce template structure logic) and so on with other sections such as portfolio, common and other template files. This will search for file my-example-template.php in kalium/templates/my-example-template.php folder first and pass the local variable $hello which outputs “world” string. If the template file exists in kalium-child/templates/my-example-template.php then the parent template will be ignored and this will be loaded. Each Kalium template file has version number so if there is a new version for that template and you are overriding and you are using an older version on your child theme, you will be notified about it. Blog section has been entirely recoded from scratch with simplicity and performance in mind. This is the first step that leads Kalium towards a bright future of templates which will be much easier to customize each template, modify and add new hooks and also offers an independent API for each theme section. The same structure is applied to core and other template files and in the upcoming updates of Kalium, all sections such as blog, shop, and other pages will have the same logic and hierarchy. Important note: The old blog page templates are now deprecated. 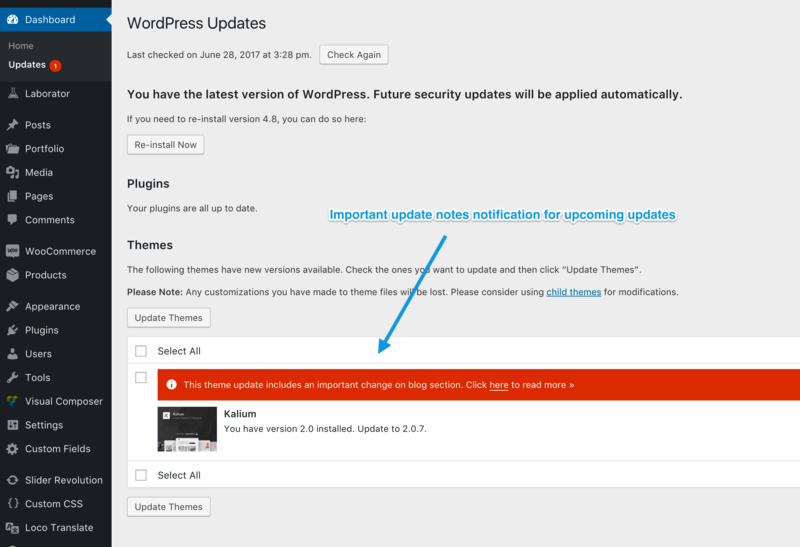 If you have overwritten any blog page template in your child theme before 2.1, those will not replace the new blog templates.